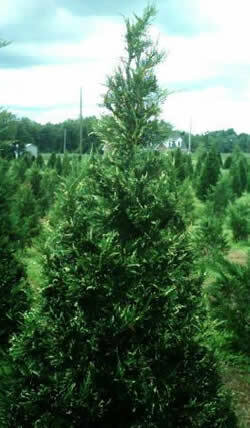 Cupressocyparis leylandii - foliage is dark green to gray color; has upright branches with a feathery appearance; has a light scent; good for people with allergies to other Christmas tree types. 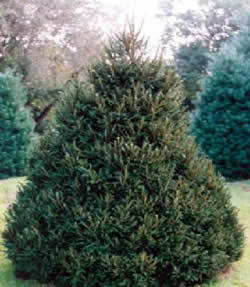 One of the most sought after Christmas trees in the Southeastern United States. Cupressus arizonica - steely, blue needles; dense, lacy foliage; yellow flowers and nice scent; smells like a cross between lemon and mint. What a beauty! 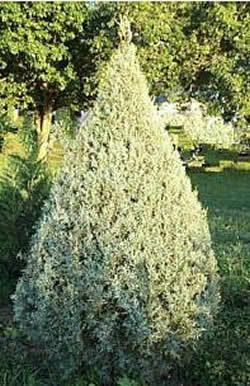 The variegated Leyland Cypress with their white or yellow tips are already partially decorated for you. You will find these on Choose and Cut farms also. 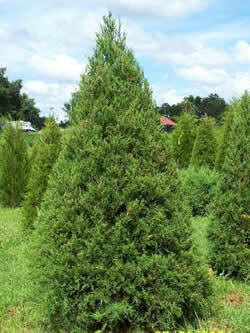 Juniperus virginiana - leaves are a dark, shiny, green color, sticky to the touch; good scent; may last just 2-3 weeks; a southern Christmas tree. Looking for and enjoying the days of old? The Red Cedar is what so many families grew up having in their homes. The Red Cedar has a wonderful scent to remind us of days gone by. 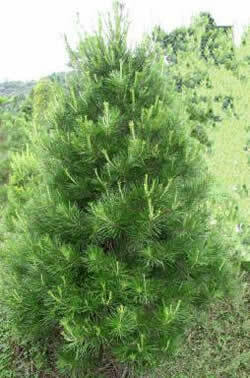 Pinus strobus - soft, blue-green needles, 2 to 5 inches long; retains needles throughout the holiday season; very full appearance; little or no fragrance; no pollen to cause allergic reactions. 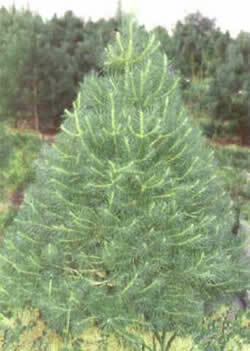 Picea abies -- needles 1/2 -1" long and shiny, dark green. It has a sharp, strong fragrance, nice conical shape. Makes a nice container tree or a ball & burlap (B&B) tree. If properly planted will live in the piedmont and eastern North Carolina. 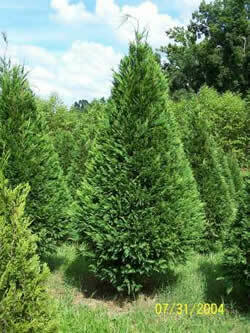 Thuja Green Giant -pyramidal evergreen with rich green color, having tiny scale-like leaves on flattened branchlets. 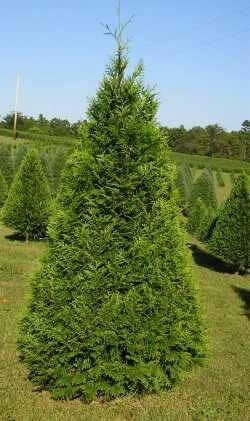 This is one of the newer types of trees for Christmas trees. Very desirable.